Come to know our NEW VENUE!! 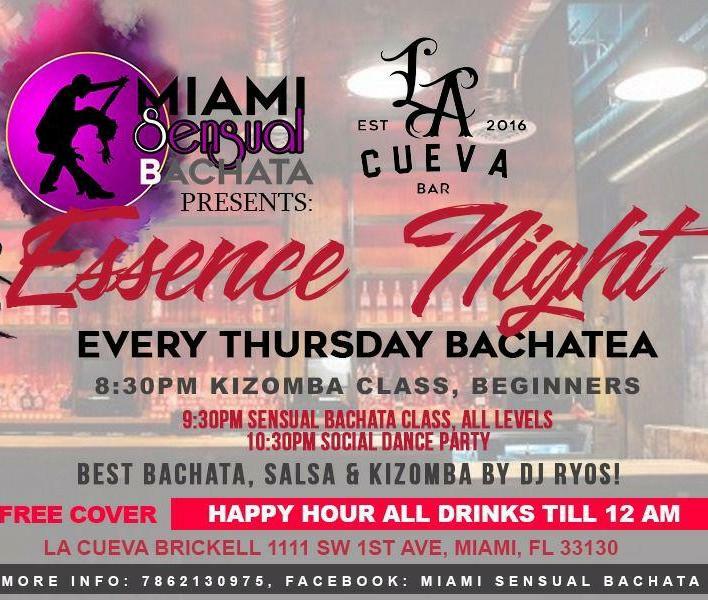 LA CUEVA BAR, BRICKELL, 1111 SW 1st Ave, 33130 ( Near Tucan Restaurant ), Cozy place with decoration like a Cave, good sound, best floor, and HAPPY HOUR IN DRINKS, ALL NIGHT!!! PARKING EVERY WHER AROUND, 1200 SOUTH MIAIMI AVE, $5 FLAT RATE. 8:30pm Kizomba classes, beginners, the dance that you were waiting for!! We start with the very basics of this amazing dance come from Africa, based on conexion of bodies. 9:30pm Sensual Bachata, all levels. 10:30pm Party dance social, FREE COVER. 70% MUSIC Best Bachata Songs ever, the rest, Salsa and some of Kizomba. Enjoy the best music by our DJ RYOS! !